We previously evaluated the responses to dietary cholesterol in children and young adults. In this study, the effects of dietary cholesterol on plasma lipids and LDL atherogenicity were evaluated in 42 elderly subjects (29 postmenopausal women and 13 men > 60 y old). Our exclusion criteria were diabetes, heart disease, and the use of reductase inhibitors. The study followed a randomized crossover design in which subjects were assigned to consume the equivalent of 3 large eggs (EGG) daily or the same amount of a cholesterol-free, fat-free egg substitute (SUB) for a 1-mo period. After a 3-wk washout period, subjects were assigned to the alternate treatment. The concentration of plasma cholesterol after the EGG period varied among subjects. 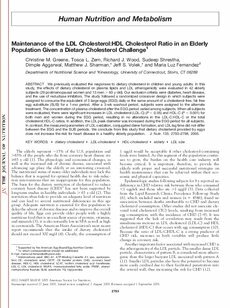 When all subjects were evaluated, there were significant increases in LDL cholesterol (LDL-C) (P < 0.05) and HDL-C (P < 0.001) for both men and women during the EGG period, resulting in no alterations in the LDL-C:HDL-C or the total cholesterol:HDL-C ratios. In addition, the LDL peak diameter was increased during the EGG period for all subjects. In contrast, the measured parameters of LDL oxidation, conjugated diene formation, and LDL lag time did not differ between the EGG and the SUB periods. We conclude from this study that dietary cholesterol provided by eggs does not increase the risk for heart disease in a healthy elderly population.